63 Objects From My Son’s Mouth, is a project by artist Lenka Clayton, documenting the objects she found in and removed from her baby son’s mouth. The Museum is extremely grateful to object artist Kate Murdoch for the link to this beautiful presented yet challenging piece. My initial response to this list of objects was one of horror… How could a mother put her child somewhere where it was possible for him to play with these items so that she had to retrieve them from his mouth? How many had been ingested rather than retrieved? Parenthood is chaotic. Childhood is exploratory. Any semblance of control is an illusion. I then began to think about the relationship between artist and child. I recall a female artist telling me that I could not be an artist and a mother… Was this more evidence that gave weight to her argument? To be an artist puts your child at risk? To be a mother puts your art at risk? I start to think about the collection of high risk items retrieved… Why would you save them? To quantify risk and measure subsequent guilt? And to place them in the grid… Ordered, listed, catalogued…. controlled? Life isn’t like that is it? The work is beautiful, and conceptually interesting. The photography is sumptuous. Yet as you start clicking on successive images surely doubt begins to creep in? In my case followed by waves of incredulity and concern. I’m not sure how to feel. If I believe that all these objects really were removed from a baby’s mouth I begin to picture a radical and potentially dangerous experiment in childcare. I picture a baby put out to forage, or one encouraged to mouth all those objects, in a way contrary to the usual parental norms of censure and protection. I also imagine a sensory seeking baby – one whose compulsion it is to mouth all manner of objects. This being a specific question during my recent diagnostic assessment for autism. I was able to tell the eminent Dr Gould that I had famously swallowed two coins and a burst ballon at 18 months (this becoming family legend). This was what my mother remembered/ knew about and anxiously awaited evidence of evacuation, but most probably there were many more. Dr Gould nodded and ticked, as this fitted all the other information she had gathered about me. Tiny babies do put things indiscriminately into their mouths, and teething babies will chew whatever it takes, but parents watch them (as much as they can). This parent was, it seems, on it when it came to object retrieval, but what was happening on the gate-keeping front? There is something about the forensic way this work is laid out, a detachment in the listing of objects such as “sharp metal pieces” which make me snap. I think of a tiny infant’s soft skin and vulnerability to harm. Toddlers are more robust and can seem bullet proof. All manner of things can occur in the blink of an eye. As artists we push boundaries, but many questions here arise. Perhaps the unspoken and darker undercurrent on presenting this work is the question of privileging and protecting material through the medium of art. You have to ask how, for example, a client of Social Services would be perceived and treated if such evidence were viewed by a caseworker. What in this case would the outcome be? In this digital era – this presentation is also the child’s legacy. I find it intriguing to think about how this will pan out as the child grows. I’m keen to hear other reactions to the work and can insert further contributions at any time via email. This blog post appears as the Museum begins to pick up the threads and we welcome visitors once more after a quiet period. It is written in gratitude for two great gifts – those of friendship and insight. Yet again, here at the Museum we find it is the objects which connect us and draw us closer into narrative. Today Sonia Boué writes an personal post about growing up with food, kindness and love at the end of two sets of apron strings. I’m on the 17.33 Birmingham to Reading train – just pulling out of the station and I feel a strong wave of emotion pass over me as I reflect on my day spent in the company of strong women. Sunshine and a smooth arrival by train. Birmingham is my hometown and despite the endless rejuvenation of this incredible city I still know my way. The route to today’s meeting is all about the changes – about noticing what is new and what remains of the Brum I knew decades before. I feel easy and light. I’m meeting with artist and fellow a-n blogger Elena Thomas, who’s become both friend and now also now collaborator. Today Dr Jacqueline Taylor (artist/researcher) will join us to discuss a project we’re developing together. 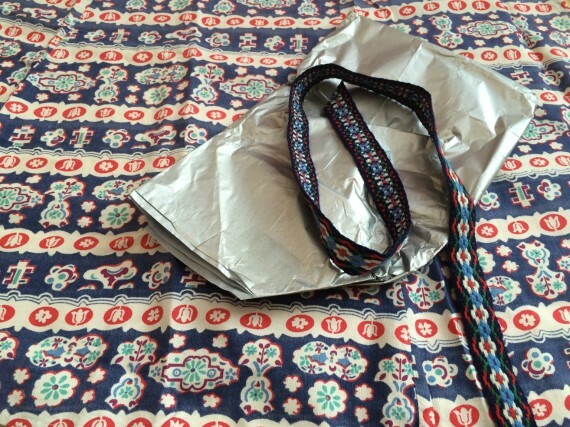 Jacqueline can provide the kind of theoretical unpinning to our project I’ve dreamed of ever since my earliest adventures with my grandmother’s handbag led to my use of objects in my work. This is exciting. We sit around the table and talk a while about the genesis of the project, filling Jacqueline in. It’s going well. Elena has a gift for me – but I decide to wait to open it. I want to savour the moment and do it justice. But as the conversation flows Elena needs me to unwrap it – we need it to illustrate a point she’s trying to make about the draw of objects in our lives. It’s beautifully wrapped with a kind of braid that looks Tyrolean to me. I’m making it up but I like the sound of the word as it trips from my mouth. The real point is that it looks to have unwound itself from Heidi’s waistband. Heidi as we know had no suitcase and wore her entire wardrobe up the mountain. This feels relevant somehow. We will be discussing suitcases too. I pull it open, unfold the silver tissue, and gasp. It is the most charmingly beautiful homemade apron I have ever seen, I say. Jaunty, with tulips in the design! I thought it looked Spanish? Elena said. I thought of you! Yes – it could be. It could also be Tyrolean. As we take turns at feeling it and enthusing I declare it an apron of perfection. Performance rose up in my mind and I wanted that apron about my waist, only the cafe inhibited me! Part of my fascination with Birmingham lies in my schooling, surrounded by warm and powerful women of working class background. Mine was a rough school, in a predominantly working class area, a culture quite apart from my intellectual refugee/immigrant roots across the city in leafy Edgebaston. But a complex learning disability – unrecognised at the time – rendered me alien in my own home in one important way. I was rebellious and not intellectual. At school I was an oddity – hispanic and middle class with outrageously frizzy hair (this naturally was the era before proper “hair products” though we did have tongs and blow drying). And so I shuttled between cultures on the journey to and from school – a long, winding, and cigarette infused bus ride. I could have, and did at times feel estranged from both my destinations, yet there was enough warmth to draw me into both. Looking back, the “Tyrolean” apron safely stowed in my backpack, I suddenly see that it was the aprons at both ends that kept me going. My mother on one hand, statuesque at the helm of our galley kitchen (apron at her waist) and the dinner ladies on the other, their deep humanity unconstrained by the white starchy uniform apron. My dinner ladies, wore their white hats askew and twinkled. The food in those days was freshly made in the school kitchen and mainly good. We chatted and queued nudging one another glad to be out of class, we sniffed the air in anticipation, and the chain of whispers would begin. Crumble and custard! Or, oh no! Pilchards! In my memory of those days I was unfailingly greeted with a wink and an extra scoop of whatever was going. Food, served with kindness, and love. And so it was at home, equal doses from my mother’s kitchen of food, served with kindness, and love. At both ends, it seems to me, this was never wavering. The apron – jaunty and joyful with it’s home machine stitched seams nicely fraying in parts – is soft because it has been washed often. It has been washed because it has been used often too, probably in the service of food, kindness and even love. At the end of the meeting Elena drove me home. I wanted to have a cup of tea with my mum before leaving the city. Aged 89, mum still takes infinite pleasure in doing the honours. Tea and a Mr Kipling apple pie. Not homemade, she remarked, but not bad! I have a large and capacious apron too. I’ve used it for performance but it also stands by in the kitchen. It strikes me that the apron is one of the great unsung garments of past and present, containing powerful associations. We often talk about apron strings as constraining, but the connotations for me are warm and wonderful. Please watch this blog for further news on our collaborative project, which is in development. The Museum is delighted to host a blog post by artist Elena Thomas – our first ever contributor – on the theme of “usefulness”. There are exciting developments for the Museum behind the scenes, so watch this space. For now enjoy! Our thanks to Elena for this most thought provoking piece of great relevance to the current global crisis of displacement. Those who don’t can sometimes find it hard to understand the usefulness of something seemingly useless. As I contemplate new work, I am thinking of objects and garments… again… of course. Kate Morgan-Clare in her blog ARTWORKER asked the question “What would you take?” when talking about people being displaced from home for whatever reason. Of course, as you look around your home, EVERYTHING is useful in some way. Cups bowls chairs blankets phone tools computer… blah blah blah… but you cannot take it. There isn’t room, or time to decide. You don’t know what you will need because you have no idea where you are going TO, just where FROM. In two weeks time you might discover that you really need that weird little knife from the kitchen drawer, it is just the thing needed. But it is too late. So you manage with something else. So did you really need it? No, but you were reminded of it. The reason we need the thing we took to the tip a week ago is only because we have been reminded of it. Suddenly, too late, we see the value. But we hadn’t used it for ten years. So it wasn’t useful was it? We cannot anticipate which of the objects of specific use will be useful. So the discussion is moot. So what do we take with us? The only thing we know for sure we will absolutely need, come what may, is comfort. So we take the weird stuff. A smelly old bit of blanket, an old jumper, a toy, a book of poetry, something that smells of grandma, a photo, a letter. Only the useless can be guaranteed useful. When I am making, or writing a song, I am taking a thing, an idea, a feeling, a thought, and washing them through my filter. What comes out is hopefully something new. Something seen through my eyes, with my brain, my experiences, my knowledge, my feelings. The love song, and the embroidery and the drawing… useless things… you can’t build a house with a song… you can’t bang nails in with an embroidered hankie. You can’t feed a child with a drawing. Someone else will bring the hammer. Small objects. The pain of Miscarriage. I found the work difficult to access to begin wth but was quickly charmed and somewhat overwhelmed. I noted to my shame a momentary flinching from the subject. We fear emotional pain, and the loss of a baby is particularly poignant, but there’s something more I can’t quite grasp. An extra layer of difficulty in processing and comprehending this kind of grief. The photographs are in black and white, which I think serves to create a balance between archival documentation and emotionality. 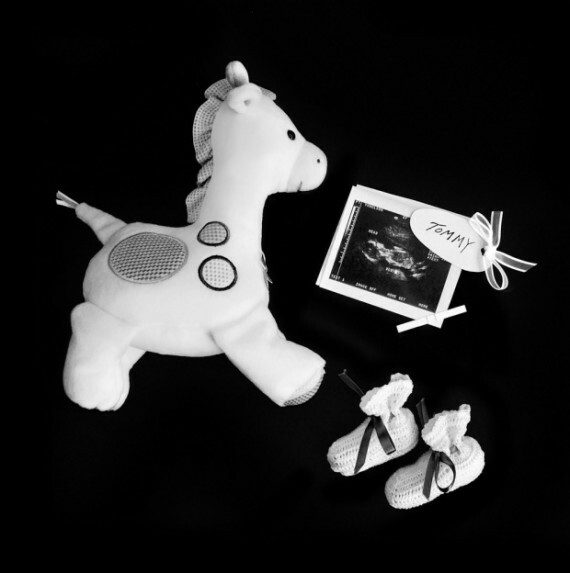 The use of black and white keeps these objects at a distance, signalling that they belong in the past, and yet each one has a name tag and an ultrasound scan image to personalise and memorialise. The women I’ve known who’ve gone through miscarriage count each pregnancy as though having carried a live child. What seems to exacerbate the loss is often a sense of awkwardness and a lack of acknowledgement of the subject too. I hope this is changing and more recognition of the true nature of grief on miscarriage is dawning. It feels incredible that women can suffer so many miscarriages – nature is at time unbearably cruel. What I really love about this work is the heartbeat that pulses through it. In particular the image for Georgia, which conjures the body of the child through the clothing, strikes me in this way. It’s almost playful, and would definitely seem so if the viewer was not aware of the context. I love too the courage and the coming to terms with loss this body of work implies. It commands many emotions in the viewer and is well worth spending time over. The museum has been quiet since a flurry of excitement about the epic Joseph Cornell exhibition at the Royal Academy this Summer. I must confess that I’m finding it increasingly difficult to focus on this space with so much diversification within my own practice. It’s a shame because the museum holds a wonderful collection of blog posts and has been exciting and rewarding to work on. I’m so grateful to all the artists who’ve participated and written posts. The answer in part is to re-tweet the posts from time to time. This is what I plan to do over the holidays. All that lovely material is stored here thanks to a-n so it takes only a few clicks to re-release the goodies to new readers. On the eve of the biggest of Christian holidays when toys are stowed under fur trees (real or fake – another potential object for the museum!) it feels appropriate to donate these two dolls from my project. 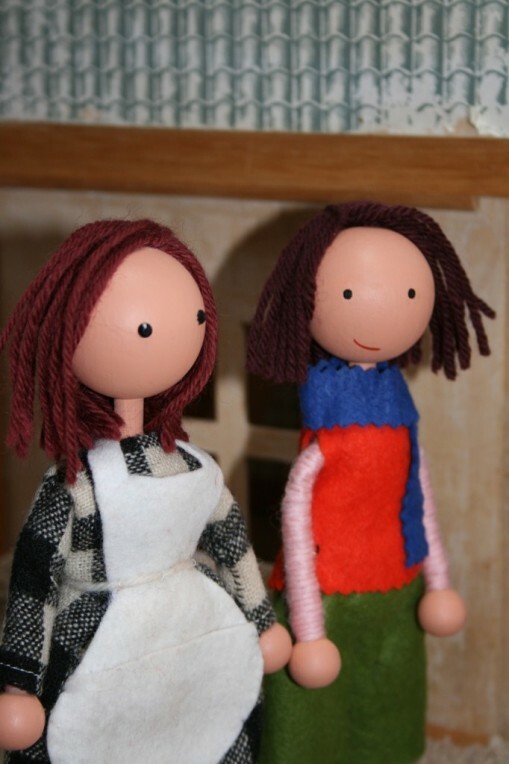 They are the postmemory dolls who’ve featured in several experimental videos. They were bought at my local art shop and then painted and dressed by me. They are German in origin but are no longer available through the art shop and I’ve been trying to source them online. I’ve been told that probably they’ve been taken out of production. How sad! This kind of doll could become rare. I’ve seen others on the market but they don’t share quite the same aesthetic. The joy of making them and learning to use iMovie to bring them to life has been immense. They fascinate me as vehicles of narrative but also pull at something ancient within me – the years spent in front of children’s television in the 1960s and 70s. My love for the aesthetic and story telling of The Magic Roundabout. So I’m calling this post The Visitors because I imagine these dolls turning up wide eyed at the museum. They’ll love all the objects and spend a great deal of time trying to make sense of it all. I love the kind of logic children engage in when adults are not around to edit or correct them. I can just imagine the conversations they’ll have! So it’s happy holidays from the museum and great excitement about unwrapping some of those old blog post! Ho! Ho! Ho!